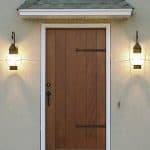 This 42″ X 96″ Door has a Segment Top V-Groove Raised Panel with a Speak Easy and matching Jamb was built out of Knotty Alder and was Stained, Finished and Installed on a home in Pike Road, Alabama. We used 8711 Casing with 8387 Backband for Interior Casing. The Hardware is Rocky Mountain E-701/E701 with a 4″ Ring Pull in Bronze Dark Finish. The door was stained with Highlighted Special Cherry Stain. The glass is Leaded Seedy Diamonds and there is a Speak Easy Door on the Inside. Click on Speak Easy Door to see Detail Information about these doors.